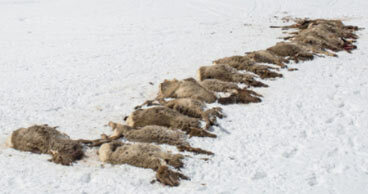 19 elk found dead and not eaten on the McNeel Elk Feedground near Bondurant, Wyoming. Photographed on March 25, 2016, by Ryan Dorgan. Bondurant, Wyoming (lower right red circle), and the McNeel Elk Feedground are about 34 miles from Jackson, Wyoming. March 26, 2016 Bondurant, Wyoming - The U. S. Fish & Wildlife Service based in Montana along with the Wyoming Game and Fish Department are reporting their speculation that in the McNeel Elk Feedground near Bondurant, Wyoming, a pack of Gray wolves recently attacked 17 elk calves and two adult elk cows in “surplus killings.” That means the wolves killed all nineteen, but did not eat them. Exact date of deaths unknown, but photographs of the relatively fresh-looking elk bodies were taken on March 25, 2016. Next PostNext Old Nuclear-Powered Satellites Orbit Earth with Plutonium Onboard. One Crash Could Contaminate Thousands of Square Miles.